Covering the properties of over 8,200 compounds, this volume, written by the world’s leading authority on chemical engineering, is more comprehensive and thorough than any other book of its kind. 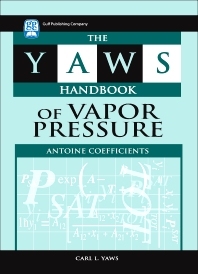 Antoine coefficients are one of the most important properties to industry processes, and Carl Yaws provides all the skills necessary for every chemical engineer, both academic and experienced. Understanding Antoine coefficients for vapor pressure extends to numerous other practical engineering processes, such as pure components in storage vessels, the concentration of species in vapor, relief valve design, as well as emissions into the environment from exposed liquids. And many other processes, for distillation columns, phase separators, and other mass transfer process equipment. Not available anywhere else, the information in this handbook is a valuable addition to any engineer’s library. Carl L. Yaws, PhD was Professor of Chemical Engineering (retired) at Lamar University, in Beaumont, TX. He has industrial experience in process engineering, development, modeling, and design at Exxon, Ethyl, and Texas Instruments. He is the author of 36 books and more than 1,000 technical publications (papers, presentations, and chapters in books) in process engineering, property data, and pollution prevention. He is a leading authority on property data of chemical compounds for use by practicing engineers and scientists.